There are many stereotypes about the Midwest. For the most part they're accurate. People do seem a bit friendlier. The pace is a bit slower. People are generally a more conservative. While I've adapted to all of those changes, after 18 years there is still one thing I still can't get used to, the lack of spring. Here in the upper Midwest spring is binary. It's either on or off. Even when it does arrive it only stays for a couple of weeks, and then it quickly gives ground to summer. In the Midwest, spring is an express train passing through town. One day it's the dregs of winter, then a few days of warmth, then the oppression of summer sets in. In the northeast spring is slower. Spring is coy. Late February always brought at least one day in the 60's. By March, snow was aggressively receding, and the first flowers of the year started to appear. Sure there were snow storms in March and April, but you knew it was just winter's final rasp. For every snow storm there was another day of skin temperature breezes. The air has an earthiness that smells of re-birth. Birds singing over the sun glistened dew covered lawns. Spring teases. Spring entices and seduces. Spring promises. Spring is lingerie. Spring means asparagus. Today will be the first of two asparagus recipes. This one is from SeaShell Sal and is admittedly a touch difficult. The results are spectacular, though, and don't worry, spring is here, what can go wrong? Steam asparagus just until crisp tender, about 3 minutes. Transfer to bowl of ice water to cool. Drain. 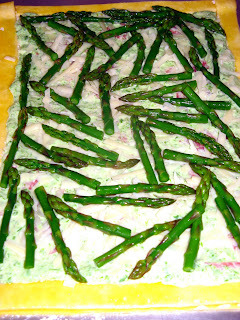 Cut off top 2 to 3 inches of asparagus tops; set aside. Coarsely puree remaining asparagus stalks in processor. Add remaining beaten egg, ricotta, 3 teaspoons oil, and salt; process until thick puree forms. Transfer to bowl; stir in salami and 1/3 cup Comté cheese; season with pepper. 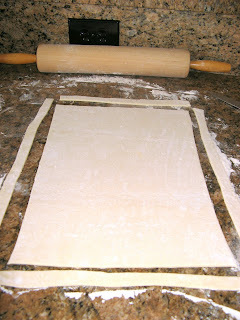 Spread mixture evenly over pastry. Sprinkle with remaining 1/3 cup Comté cheese. Toss asparagus tips with remaining 1 teaspoon oil; arrange tips over filling. Bake tart until filling is set, about 25 minutes. Serve warm or at room temperature. Market Tip: Comté cheese is a semi firm, Gruyère-style cow's-milk cheese. It is available at some supermarkets, cheese shops, and specialty foods stores. Crabby Tip: Serve this tart warm, otherwise the cheese overwhelms the other flavors. Tip No. 1: Using frozen puff pastry makes this recipe fairly easy, but you have to let it thaw about 40 minutes out of the freezer, on the counter. Don't be shy about flouring the granite counter or board to roll it out on. Be gentle, the pastry is soft. Use a ruler or measuring tape to get the exact rectangular shape. Cut the pastry with a serrated knife and it will go easily. Tip No. 3: Transferring the pastry to the baking sheet is a little tricky. Ask a friend to help and use two of the largest spatulas you own. Have the baking sheet right next to the pastry so you don't have to go far. 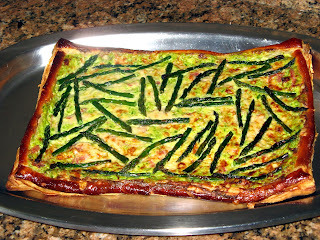 You can prepare all the ingredients, make the filling and blanch the asparagus while the pastry is thawing so this takes less than an hour to assemble. I'd serve it with champagne or sparkling wine. A California Domaine Chandon Blanc d'Noirs, $15-20, would be a great accompaniment. Asparagus is a difficult wine match. The South Africans idea for making Sauvignon Blanc is to create an Asparagus flavor to the wine. So, try a South African Sauvignon Blanc with this dish. Prices will vary, but the flavor will not. PS. I love Asparagus, but hate South African Sauvignon Blanc, but dont take it personally. 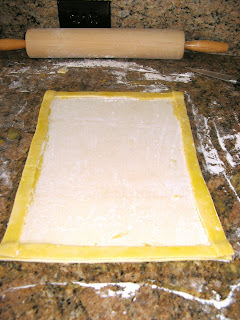 Not that I'm lazy or anything, but I transferred the pastry to the baking sheet before putting the strips on. I would have rolled it out on the cookie sheet, but my rolling pin doesn't fit. Geez, this is tasty, but isn't there a way to get some butter in it?